Nigeria restates zero tolerance for human trafficking – Royal Times of Nigeria. Nigeria has restated zero intolerance for human trafficking, saying it has put in place strong measures to eradicate the menace in the country. The Ambassador/Permanent Representative of Nigeria to Vienna, Mrs Vivian Okeke, stated this in New York at the High-level Meeting of the General Assembly on the Appraisal of the UN Global Plan of Action against Trafficking in Persons. Okeke said Nigeria considered the meeting very important, in view of the need for global solidarity and cooperation to fight the menace of trafficking in persons. “Nigeria is not exempted from the scourge. It has been both a destination country and an export country where vulnerable persons especially young women and boys are lured across the Sahara to other continents especially Europe. “Our Government has zero tolerance for trafficking of human beings, whether young or old, men or women. “And this is the reason why we have put in place strong institutional measures and legislations. “To eradicate these inhumane practices and ensure that those engaged in such illegal acts are made to face the full rot of the law. Nigeria has long criminalised the trafficking in persons and has taken several efforts to actualise our national priorities at fighting the menace, she said. Okeke said one of the measures taken against human trafficking was the establishment of a permanent mechanism – the National Agency for the Prohibition of Trafficking in Persons (NAPTIP). The Nigerian envoy said NAPTIP was established in 2003 to rescue, assist, support and cater for victims of human trafficking, as well as arrest, prosecute and jail the perpetrators. She said the Trafficking in Persons Enforcement and Administration Act of 2015 has broadened the scope of national legislation against trafficking in Nigeria. According to her, Nigeria could be classified as one of the few countries in the world that has in operation potent legislative regime against trafficking in persons. “Nigeria has expanded its prosecutorial mechanism against trafficking in persons. In this regard, and going by the recent statistics from NAPTIP, a total of 345 victims of Trafficking were rescued during the first quarter of this year. 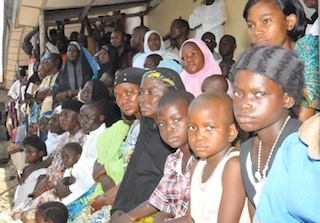 “This figure brings the total number of persons rescued from trafficking since the establishment of NAPTIP to 10,815. “In the area of prosecution and arrest, a total of 90 traffickers were arrested for various forms of human trafficking during the same period. “This figure includes 50 females and 40 males. Also, of the 42 cases referred to various courts for prosecution, 22 have been successfully charged and prosecuted. “Nigeria has also strengthened international partnership and collaboration in the area of fighting trafficking in Persons. “This collaboration has yielded mileage in the rescue of victims as well as prosecution of human traffickers. “For instance, out of 345 victims rescued by NAPTIP in the first quarter of this year, 288 representing 83.5 per cent of those rescued were through international collaboration and partnership. The Nigerian envoy called on the global community to intensify supports for the operation of the United Nations Voluntary Trust Fund for Victims of Trafficking, so as to make it relevant to the fight against trafficking in persons. “Nigeria reaffirms its commitment to the efforts of United Nations Office of Drugs and Crime and Inter-Agency Coordination Against Trafficking in Persons in their sustained operations to end trafficking in persons. “We, therefore, advise against any attempt to undermine the work of these bodies in their collective efforts to discharge their mandates,” she said.